This dish tastes rich and special, thanks to the addition of the beer. Leffe Blonde from Belgium is a dry, fruity, slightly spiced beer that blends particularly well with robust flavours. Tip the pork into a large bowl and sprinkle with the flour and thyme. Toss the pork in the flour and thyme leaves until it is evenly coated. Heat the oil and butter in a flameproof casserole or large pan. Add the shallots, cover and cook gently for about 10 minutes, stirring occasionally, until they begin to soften and colour a little. Remove from the pan with a slotted spoon. Add the pork to the pan over a fairly high heat and fry until the meat is sealed and starting to brown. Return the shallots to the pan, then stir in the beer, stock and sugar. Season generously, then bring to the boil, stirring well. Reduce the heat to a simmer, cover the pan and cook for about 40-50 minutes until the pork is tender. 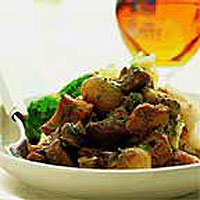 Taste and add the mushrooms and more seasoning if necessary, then cover and simmer for a further 10 minutes. Sprinkle with chopped parsley and serve with mashed potatoes. Please note: Ensure the pork is cooked thoroughly, the juices run clear when pierced with a knife and there is no pink meat. Wash work surfaces, utensils and hands thoroughly after handling raw meat. This dish freezes well for up to 3 months - freeze before adding the parsley. Defrost thoroughly in the fridge before reheating.